Large diameter tanks are sought after for a variety of reasons. When designed properly FRP materials can provide excellent high-temperature capabilities and solvent resistance. Depending on resin selection and other design factors, unique characteristics may be enhanced. In general, FRP withstand many acids, alkalis and oxidizing chemicals. 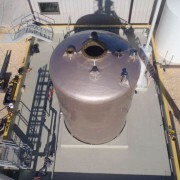 Another one of those reasons is that there can often be an inversely proportional relationship between the cost to store a material and the diameter of the tank; in many cases the cost per gallon to store a material goes down as the diameter of the storage tank goes up. 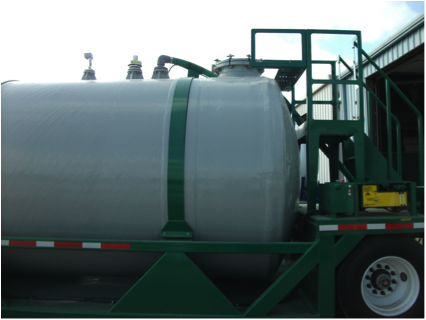 Thus, in some cases large fiberglass tanks may be a means to a more cost-effective solution. There are many strengths to utilizing fiberglass in your project design. Large diameter fiberglass tanks can be designed with advantageous features suitable for a broad range of applications including, wastewater treatment, oil and gas, chemical processing and agricultural—just to name a few. Fiberglass is versatile and importantly can be corrosion and abrasion resistant. When designed properly, large diameter fiberglass tanks can leverage key attributes of fiberglass materials, such as, high strength-to-weight ratio, dimensional stability, long life cycles and low maintenance. Our large diameter fiberglass tanks can be fabricated to meet your project specifications and meet industry standards; our custom tanks satisfy ASTM D-4907 (contact molded) and ASTM D-3299 (filament wound) standards. 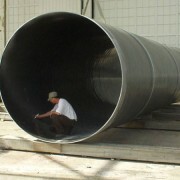 Our sizes range from 12” to 14’ in diameter, with heights as required, custom diameters are available. 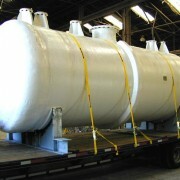 Our typical fiberglass tank design limits for pressure and vacuum is +/- 15 psig. Custom applications that exceeding these limits are special projects and are within our capabilities. We offer horizontal and vertical tanks with customized support systems including saddles and support legs for horizontal tanks. Regardless of whether this is a new project or an upgrade we can build per your specifications—our high-quality fabrications can also be designed to fully integrate into your existing infrastructure. Unique and custom tank head and base configurations can be engineered and fabricated to meet your needs. In addition to customized support systems we offer fiberglass ladders, walkways, platforms, decking, support rails, hand rails, stairways and fencing that will enhance and compliment your current design. 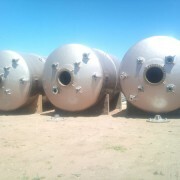 In many cases fiberglass tanks larger than 14’ in diameter are not economical to ship, shop-fabrication, field-fit and field erection may then be necessary for custom jobs larger than standard sizes. More often than not, large diameter, field erected FRP tanks are fabricated using the same materials of construction and fabrication methods as standard shop fabricated tanks. Each service environment is unique and requires special attention to engineering considerations. Special considerations such as concentration, temperature, and pressure, vacuum will need to be addressed to ensure that the product being fabricated is optimized to enhance its performance and meet your specifications. To a large degree your service environment and specifications will influence many important design elements such as resin selection, laminate schedule and corrosion barrier. Beyond design, engineering and fabrication, Beetle can assist you with procurement assistance, anchors guides and support systems, maintenance inspections, supervision repair and installation services, equipment rebuilding, and on-site modifications. Our project management and field At Beetle we offer FRP leadership; design intelligence, far-reaching capabilities, capacity, and over 50 years of fiberglass experience. Let’s share a conversation and get started.